Human workforce is the most important asset, upon which the success of the business is dependent. For the selection of right person at right job at right time is very important to sustain the growth of an organization. Thus, the recruitment and staffing service providers play a vital role and over the past century their demand has exponentially increased. The service providers have expert HR involved in providing the recruitment and staffing solutions and even customized solution as per the demand of the individual organization. The growth of organizations and their reduced capability to hire right person, majorly has the positive impact on the growth of global recruitment and staffing services market. There is growing trend of online recruitment process, which is boosted with the penetration of internet and mobile devices. Thus it helps to connect with the talent at miles apart. Therefore, online recruitment is highly benefitted to the global level businesses. Further, recruitment and staffing service firms expect for an increase of technology spending by 52.0% over the next 3 years, owing to the significant opportunities in the market. With all the advantages the major disadvantage faced by the industry is the shortage of the talent that hinders the expected performance of the recruitment and staffing service providers. Goldstein Research analyst forecast that the Global recruitment and staffing services market is set to reach USD 202.1 billion by 2025 from USD 100.2 billion in 2017, growing at CAGR 9.2% over the forecast period (2017-2025). Recruitment process outsourcing is the top priority of majority recruitment and staffing firm, 42% firms relies on the candidate acquiring solutions. Thus recruitment process outsourcing segment contributes the major share, acquiring more than 40% revenue share. Based on geography, North America accounted for the largest market share of 41.6% in 2017 of the global recruitment and staffing Services market. North America consists of major players and also has their expansion to various other countries. Further, APAC region is expected to grow at a CAGR of 9.2% on account of the rising establishments of the organizations due to the economic development activities across the various industries in the APAC region. 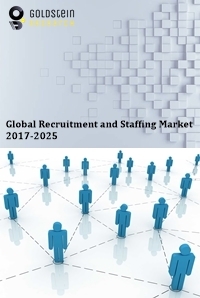 The report covers the present ground scenario and the future growth prospects of the recruitment and staffing services market for 2017-2025 along with the market players’ analysis. We calculated the market size and revenue share on the basis of revenue generated from major players in the global region. Global recruitment and staffing services market outlook 2017-2025, has been prepared based on an in-depth market analysis from industry experts. The report covers the competitive landscape and current position of major players in the global recruitment and staffing services market space. The report also includes porter’s five force model, SWOT analysis, company profiling, business strategies of market players and their business models. “Global Recruitment and Staffing Services Market Report” also recognizes value chain analysis to understand the cost differentiation, pricing models to provide competitive advantage to the existing and new entry players. Our global recruitment and staffing services market report comprises of the following companies as the key players: Adecco, Randstad, Allegis, Hays, Kelly Services, Manpower Group, Robert Half International, TeamLease, Insperity, Recruit Holdings Co.,Ltd, ABC Consultants, Global InnovSource, IKYA Human Capital, Temp Holdings Co. Ltd.